I had a sql table that was storing data in a DateTimeOffset(7) datatype, DateDeleted. I was trying to use SSIS to sync the data to another table where the DateDelted column was a DATETIME datatype. I will walk you through what this actually is. This is just a standard type conversion. When you try this you will receive a “Truncation Error”. So now it will work, but the problem is the offset is lost. In my case I am in Australia, +10 UTC. This works great, but what about daylight saving time when the offset may alter to 11 hours etc. This says get the hours difference between that DateTime version of the date ((DT_DBTIMESTAMP)DateDeleted) and the DateTimeOffset version of the date. SSIS in SQL Server 2012 now supports a “Project Deployment” model. Adding things like Connection Strings is relatively intuitive. I want to use a parameter to set my CheckPointFileName property. How can you do this so it can be configured by the environment. 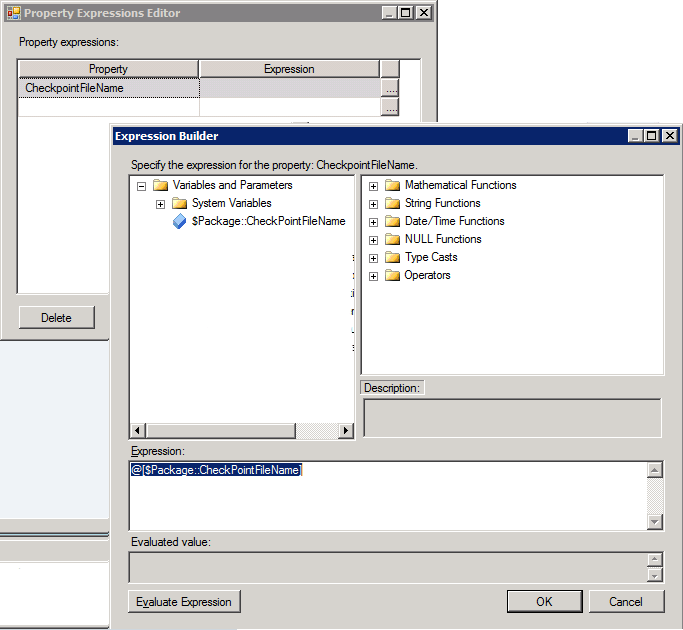 Click On the ellipses “…” on the Expressions property.